Directed by Simon Keay, the Portus Project is guided by two main objectives. Firstly, it seeks to build a better understanding of Portus itself, as well as its relationship to Ostia, Rome, and the rest of the Mediterranean. Secondly, it aims to develop techniques that will enhance the ways in which highly complex classical sites can be investigated and recorded, and evaluate the impact of those techniques. Used in combination, non-destructive survey, open area excavation, and the computer graphic representation of excavated and graphically-simulated Roman buildings are key components to achieving these objectives. 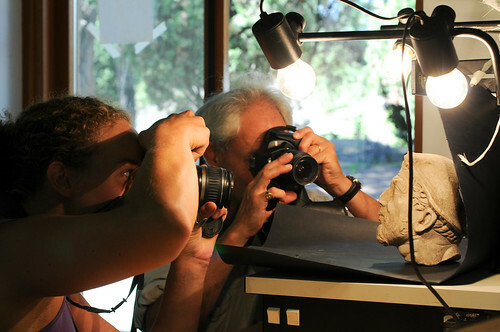 Project Director Simon Keay photographing marble head found at Portus. One Response to "Project Aims & Objectives"